Hello all! 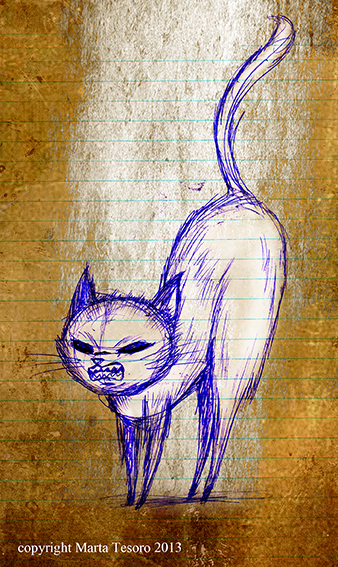 Felt like breaking up the monsters with an angry cat. I was doing some cat sketches on my notebook before going to the gym. I was sorting out how much I need to pay for taxes this year and .....oh my....it's going to be a big one. I need to buy some equipment too before the tax year ends. Sigh. Money, I don't care what anyone else says, it does buy you some amount of happiness. Like security, new clothes, food and fun. No money, means you can't do a whole lot of things. A lot of fun costs money nowadays you know! So aside from needing to tighten my belt am going to take on as much freelance work as I could possibly do to supplement income and stuff. Got to bite the bullet. I want to do certain things, so am going to work for it. Certainly not going to be lending out cash or anything like that this year...money as a freelancer is equal to security. Having that taken away is so disheartening and it drives me crazy. It's a hard balance. You can't take money with you when you die and you don't want to live to work either but money pays for the stuff I love like eating out, travelling, gym and the occasional shopping spree. Money pays for my lifestyle, paying rent and bills and being to afford equipment and supplies as I need them. It's difficult....lucky for me, I love my job. I do love freelancing and working on different projects and I find myself very fortunate to be able to afford stuff because of it.